What a charming chapter book! Nicholson succeeds in creating a clever detective mystery for middle-grade readers. At the same time, the soft illustrations encourage reluctant readers and beginning readers transitioning to chapter books to handle the ten chapters. The text is large and easy to read. 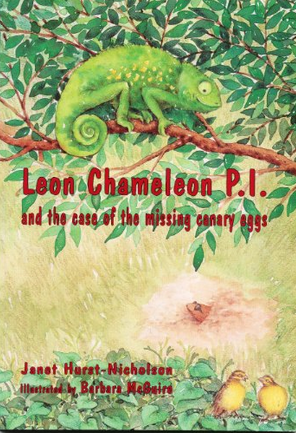 Using the technique of personification, Nicholson endows animal creatures like Leon, the chameleon, and Egg Eater the snake with human personalities and a sense of humor. Readers will enjoy practicing their sleuthing skills as they attempt to unravel the mystery of the missing canary eggs. I especially enjoyed the trial process and the very clever dialogue. This book is part of a series. Although this is my first read, I would explore reading the others. I heartily recommend this book for middle-grade readers, reluctant readers, and mystery lovers. Clever characters and crisp dialogue keep the story interesting. Enjoyable for readers of all ages. You can get the book along with a quick preview here.